At some point this past winter my mother told me she was going to be in New York City for the Romance Writer’s of America conference in July and asked if I wanted to come up and see a Broadway show with her. At first I didn’t think it was going to work out because the time she was going to be there mostly overlapped with when I was going to be in Rhode Island for the Newport Folk Festival (more posts on that to come in the next several days). We figured out that she had some time free on Wednesday, so I could go up and meet her then but I still didn’t know if I wanted to do a day trip to NYC and then turn around and go to Rhode Island the next day. My smart husband pointed out that I didn’t need to come home. I could just stay overnight in New York and then take the train from there to Rhode Island the next day. So that’s what I did and it worked out splendidly. 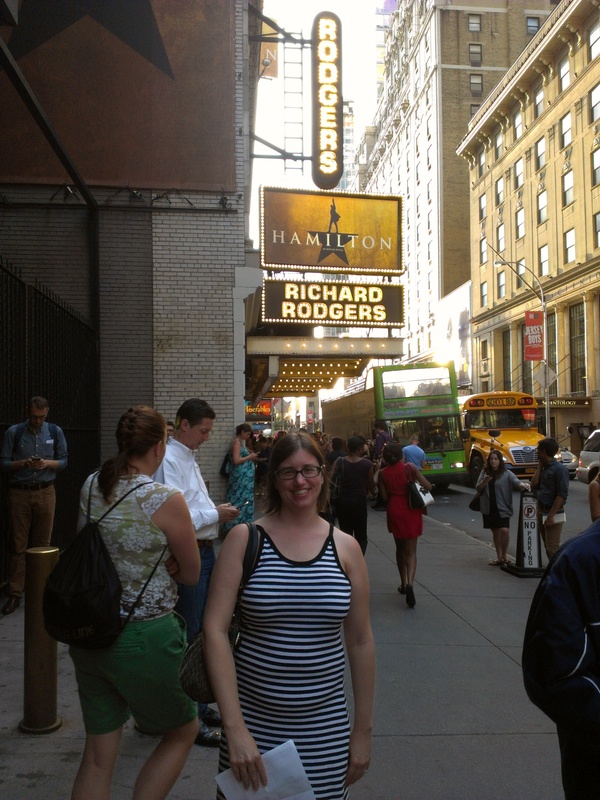 Originally we were planning on a matinee, but after seeing what shows were going to be open while we were there and consulting some theatre people I know over social media I decided what I really wanted to see was Hamilton. I had heard nothing but amazing things about it’s off-Broadway run and I had loved Lin-Manuel Miranda’s previous show In the Heights. Technically Hamilton was still in previews while we were there, so they weren’t doing Wednesday matinees. We figured out that my mom could swing an evening show, but by that point I had already purchased my train ticket for first thing in the morning. Thus I had most of the day to figure out other things to do. What to do in NYC on a Wednesday afternoon? Why obviously go see another show. 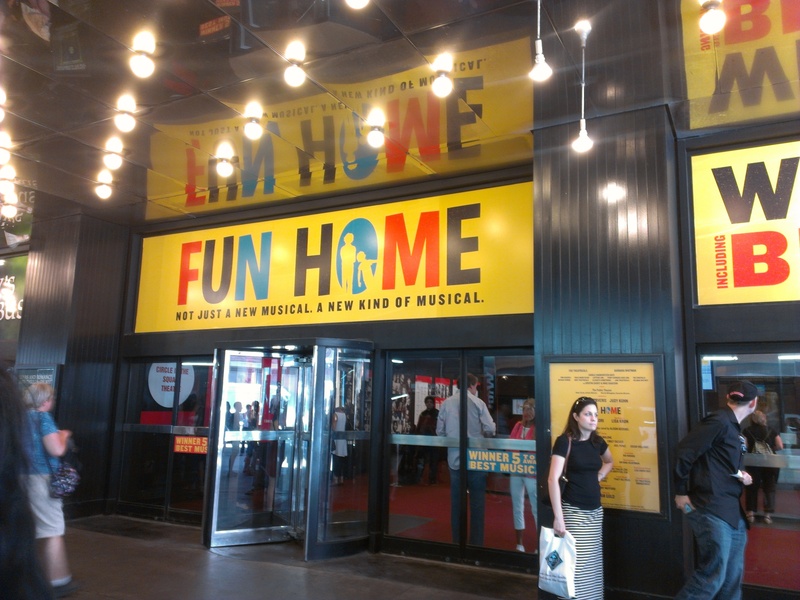 I couldn’t pass up seeing the newly Tony award winning musical Fun Home as well. After getting into the city I met up with my mom at her hotel and we had time to grab lunch together before she had conference events and I had to get to Fun Home. The musical is based on the graphic novel memoir of the same name by Alison Bechdel. It’s the story about her family, her experience coming to terms with her sexuality and coming out to parents and then finding out that her father lived his life as a closeted gay man. In the show Alison is played at three different ages by three different actresses. I am by far not the first person to say that 11 year old Sydney Lucas who currently plays Small Alison is incredible. If you don’t believe me take a look at her show stopping number “Ring of Keys”. I expect to see much more of this young girl in years to come. It’s a small, intimate show and not what you would typically expect from a Broadway musical necessarily but it works very well. It’s a beautiful show. Since my mom was going to be busy during dinnertime with a book signing I decided to try and make dinner plans with one of my Twitter friends, Jess. We had actually made plans to meet up once before when I was in NYC last October, but she got horribly ill and had to cancel. So it was great that we finally got a chance to meet up in person. She is just as delightful in real life as she is online. I like knowing that if we lived closer she’s someone I’d want to hang out with in person and no just follow online. I’ve had great luck that all the Twitter friends I’ve met in real life have turned out to be great off-line too. Granted I would never try to meet any of the people I follow online who I didn’t think I would be friends with. I follow people for all sorts of reasons and I don’t necessarily think I would get along with all of them if we met in person. We had an enjoyable dinner, and I hope we’ll manage to get together again at some point. Then it was time for Hamilton. When I chose that show to see with my mom I was a little bit worried that she might not like it because the music is mostly sung in various forms of rap. I do know she likes history though and figured that the show would be compelling enough that it would be ok. Happily I was right and we both loved it. The show if you’re unfamiliar is the story of Alexander Hamilton’s life. Speaking of talented people, Hamilton is played by Lin-Manuel Miranda who also wrote the book and music for the show. The choreography is also fantastic. It was also great to see Jonathan Groff back on a Broadway stage as King George III (though I’m sorry Looking being canceled is the reason he was available to do it). I was a little surprised that his part was so small, but he made the most of the 10 minutes or so he actually spends on stage. The whole thing was great. I know I’ll be listening to that cast recording a lot once it makes its way into the world. Thursday I also had some time to kill on my own before catching my train to Rhode Island. I started off by getting a bagel for breakfast. I’m sure I’ve said it around these parts before, but Baltimore bagels are not good. I am always happy to get a delicious legitimate bagel when I’m in New York. After that I headed down to the 9/11 Memorial. Despite the numerous times I’ve been to New York City since 9/11 happened I had never been down to that area before. I didn’t actually have enough time to go to the museum, so I just wandered around the memorial site. I also wandered a few blocks farther down over to the water and discovered some little park monument thing to the Irish famine that was also need to wander through. The weather was actually gorgeous while I was there, so it was nice to be out along the water. After that I had time to grab lunch with my mom before catching my train. It was a jam packed trip, but a most excellent one. I couldn’t have asked for a better day in New York.